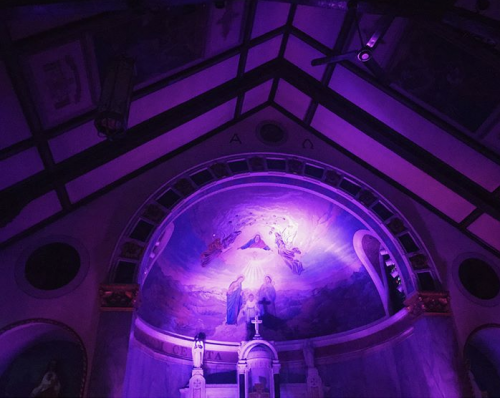 Tonight Greenpoint has two intriguing events taking place separately in church spaces. 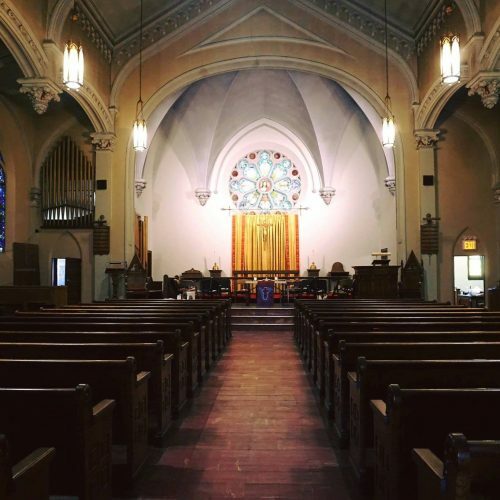 The freshly restored 200-pipe organ outfitted with MIDI functionality at the San Damiano Mission Church will provide lush sounds in three separate sets from Noah Prebish featuring Angel Deradoorian, Sabine Holler, Dominic Apa and Takuya Nakamura aka SPACE TAK at 21 Nassau Ave. from 8 p.m. to 11 p.m.; RSVP here with suggested donation of $15 at the door. Hello all! This Tuesday (the 29th) some friends and I will be hosting an evening of improvised music performed on the San Damiano Mission’s beautiful 200-pipe organ. Recently restored and complete with MIDI functionality, the organ can be played both by hand and electronically, the latter with inhuman speed and accuracy, placing the instrument at a really fascinating intersection between ancient and modern. In my time working at the Lot Radio the last two and a half years (across the street from the San Damiano Mission) I was able to spend a lot of time playing on and getting to know this totally insane instrument. I also had the pleasure of getting to know Nick and Raphael, the two priests at the church, who have been close friends ever since, generously lending us their space for various creative projects. Nick is leaving San Damiano in the next few days to move to his next assignment in NC, so I wanted to be sure we had one final hurrah while he is still here. I’ll be performing an improvised set on organ and modular synth, with live accompaniment by my friends Angel Deradoorian and Sabine Holler. Composer, DJ, and cosmic wizard Takuya Nakamura will be performing as well with butoh dance by Azumi O E. Controlling visuals will be video artist Enrique Alba with assistance from multi-talented Dutch visual artist, Sebastiaan Bremer, who created the event’s cover image.